Back in the 1960s, when the modified plesiosaur theory held sway amongst Nessie believers, we had Ted Holiday and his little monster. The letter below from Ted Holiday to the Inverness Courier on August 16th 1963 laid out his general invertebrate theory and makes for interesting reading (click to enlarge). However, in 1966, David James gave Ted an article on a new fossil find. This led to a train of thought that produced his main work, "The Great Orm of Loch Ness" two years later. That fossil was Tullimonstrum Gregarium, a strange creature found fossilised amongst the carboniferous deposits of the coal strip mines some 50 miles south of Chicago. The first find was made in 1958 by Francis Tully, to whom he lent his name to the fossil ("Tully's common monster"). 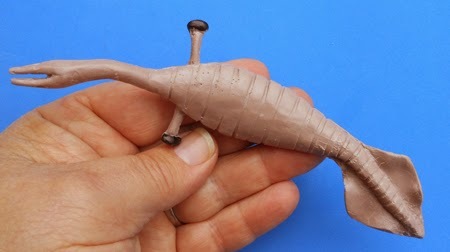 The resin model below is representative of the small size of this creature which has ranged from three to fourteen inches and you can pick up the occasional fossil on eBay for a reasonable sum. Some fossils also had a suggestion of an orifice below the "paddles" which lent speculation to the "neck" passing prey to this mouth. The creature continues to puzzle palaeontologists as to which phylum it precisely belongs to. Holiday was convinced this was the solution to the Loch Ness mystery and "bet his shirt" on it in his Orm book. The problems were obvious though and the passage of four subsequent decades of palaeontology has not altered this. Firstly, the creature is far too small compared to the typical thirty foot of a mature Nessie and even Holiday knew talk of these fossils being larval was a bit of a stretch. Secondly, these fossils have continued to be only found in the state of Illinois, a long way from Loch Ness. Thirdly, these creatures have been extinct for about 300 million years. Morphologically, the basic Tullimonstrum is no Loch Ness Monster. Only two front "paddles" are present instead of the accepted four limbs and it is a favoured interpretation that these are in fact eyes set at each end of a stiff bar structure. Ted Holiday would try and find parallels with these bulbous structures in the Hugh Gray and Kenneth Wilson photographs as well as descriptions of appendages in such cases as the Spicers. Certainly, the two side objects in the Hugh Gray picture continue to generate speculation, but even if the Wilson picture was not a hoax, I doubt a case for any appendage could be made from it. It should also be borne in mind that despite talk about lobes on the Spicer beast, Tullimonstrum was most likely incapable of locomotion on land. The alleged lobe on the Spicer monster is another source of speculation. The sceptic suggests a deer's head, the opposite camp has tended to it being the tip of the creature's tail. So why was Ted Holiday so wedded to this creature, despite the difficulties? Even though the plesiosaur theory had its challenges, it certainly seemed to be far more plausible than this creature. Holiday was certainly an original and lateral thinker who was prepared to think outside of the box, but even this would seem to be a speculation too far. Eventually, Holiday moved over to the paranormal camp, though it seems he still tried to synthesise his worm theory with this paradigm. Therein lies further problems and one wonders what Ted's final thoughts were before he died of a heart attack in 1979. Personally, I never quite embraced Holiday's idea of a giant worm. His general proposal of a gastropod of the nudibranch family had its attractions, but the main problem was always size precedence. I don't think species of this class ever exceed one metre in size. Meantime, reptile, amphibian or mammal advocates could at least point to something big that was living or extinct that indicated size possibilities. Nevertheless, Ted Holiday was an original thinker and if this mystery is to be solved, then it is going to require some more of that type of thinking. New Sonar Image of Nessie? I noticed this image appeared on the Highland News today. It was captured on the sonar equipment of the cruise ship, the Jacobite Queen which runs along the top half of Loch Ness. You can read the article here. Jacobite Cruises also mention it here, but currently without further detail. Somewhat frustratingly, no analysis is done and so one is left wondering what is being looked at. Clearly, the crew who use the sonar are not used to seeing such a trace, hence their curiosity but also their non-commitment to an interpretation. If I may add my own observations, the "753" in the bottom left presumably refers to a depth of 753 feet which places us firmly in the deepest parts of the loch, perhaps around Urquhart Bay. In fact, the maximum depth of Loch Ness is a bit of a movable feast, Wikipedia states it as 744.6 feet but another source states 786 feet. Wrongly configured sonar can record excessive depths. 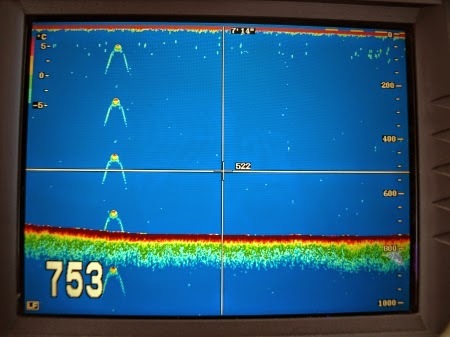 I have seen several sonar traces presented by cruise operators over the years with interpretations which ranged from "the monster" to "zooplankton on the thermocline". More often than not, a simple "I don't know" is the response. Given that we don't even know if the Loch Ness Monster has a swim bladder, lungs, inflatable humps or no gas filled sacs at all, this would seem the best response. Thanks to regular reader, Jake, it has been established this sonar image was recorded in 2009 when British actress Vicki Michelle was on the Jacobite Queen. The original story is here. Sigh! We had the old Apple satellite image and now this. How about something new, media?